The story of one of Ireland's greatest monastic settlements is brought to life, in a manner never before revealed, in this newly re-released documentary. The Kells Story: an Irish Monastery in a Time of Trouble delves deep into the monastic period of Irish history - a time when Ireland earned its reputation as 'the land of saints and scholars' - helping to lift Europe out of the period following the decline of the Roman Empire, often referred to as The Dark Ages. During this period, Irish monks excelled in the study of Latin and Christian theology. Many scholars from other parts of Europe came to visit these Irish monasteries. The legacy of that period has been preserved, right down to the present day, in the form of illuminated manuscripts (e.g. The Book of Kells), metalwork (e.g. the Ardagh Chalice) and sculpture (e.g. the High Crosses, many of which date from at least 8th century and several of which, can be found within the town of Kells). Narrated by several local historians, this documentary traces the early history of Kells: from its foundation around 804 AD, by monks fleeing Colmcille's monastery in Iona to escape Viking attacks, through its survival over a period of more than 600 years that followed. Contributors include Aidan Wall, Joseph Rourke, Rev Gerard Rice, William Carr. The spirit of the ancient site of Kells, in the Irish county of Meath, is captured and its rich cultural legacy explored: from the world famous Books of Kells, the architecture and archaeological relics that dominate the landscape of the town right down to the present time, portraits of the personalities who were at the centre of monastic life in Ireland. 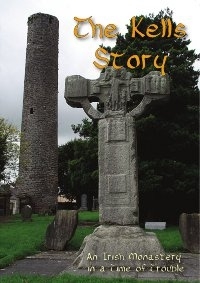 The story of Kells is integral to an understanding of the monastic period of Irish and European history. It is told here in a lively, inventive, educative and entertaining manner, which will leave you wanting more. Purchase the DVD from CreateSpace and have it shipped to you. Watch it Today. Buy or rent this DVD from Amazon Instant Video and download it directly to your computer, laptop, tablet, etc. 1. The Early History of Kells including the earliest written records, which date back to 804 AD, as well as that which has been handed down by oral tradition. 2. The Foundation of the Monastery at Kells, by monks from St Colmcille's monastery in Iona, who were fleeing Viking pillaging and depredations. 3. The Vikings are Coming looks at the impact of various Viking raid on Kells itself. This was the period of the Round Towers. A contemporary account of a Viking raid, on the English town of Malden in Essex, is recounted. 4. Colmcille/Columba was a member of the O'Neill clan, of royal blood and a direct descendant of Niall of the Nine Hostages. Despite his status, he preferred to devote himself to matters of faith and the spreading of the gospel, so much so that he became known as Colm of the Church. 5. The Book of Kells as a visual reflection of theological ideas that would have been current at the time is considered. We see how these theological premises and precepts that would have informed the manner in which the book was presented and designed. 6. High Crosses and St. Colmcille's Well explores just some of the extraordinary relics and remains that characterise the town of Kells. 7. Purpose and Function of the Round Towers explores monastic life in more detail, the daily routines and also, the measures that the monks would have taken to protect themselves against Viking raids. 8. Fortified Fort of Kells looks at the first fortifications, which were build by the Normans around 1170 A.D.
9. Colmcille's House is a small stone roofed oratory, probably dating from the 11th century, which would mean that Colmcille himself never lived in it. The name survives however, just to add to the enigma that surrounds not only this structure, but the story of Kells itself. You can contact us by phone and by e-mail. For further information about Kells Media Productions, please visit our website. The Kells Story DVD is available to buy online in a variety of digital formats.